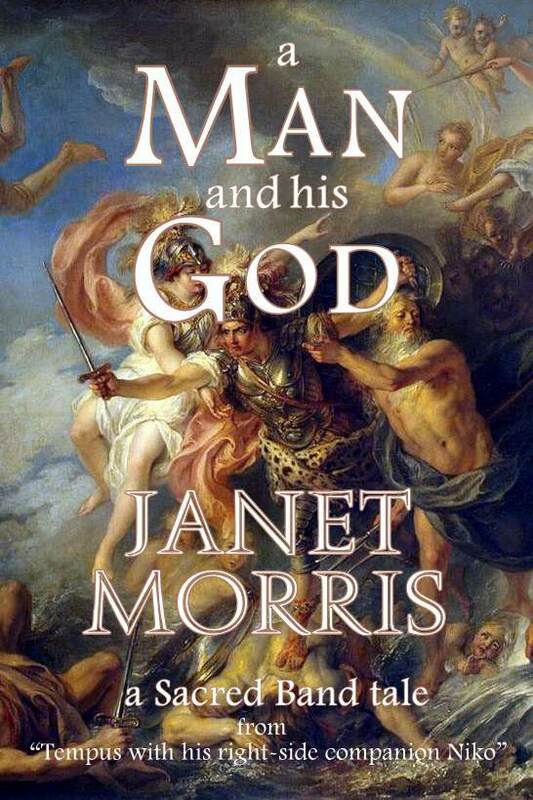 The team of Janet Morris and Chris Morris once again grace us with another excellent collection of Homeric Heroic Fantasy, featuring Tempus, Niko and their Sacred Band of Stepsons. 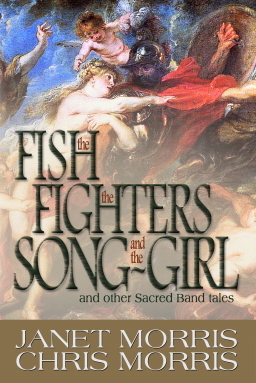 This compilation is comprised of both new stories and earlier tales, herein revised from the originalThieves’ World® series, stories such as “What Women Do Best,” “Power Play,” and “Sanctuary is for Lovers.” Brand-new tales, written especially for this book, include “Shelter from the Storm,” “Lemnian Deed,” “Ravener, Where Art Thou?” and the title story. 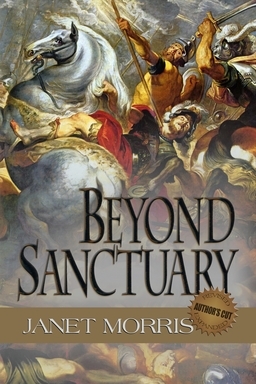 And, while we travel through unknown territory with Tempus, Niko and the Sacred Band, most of these stories are centered in good old Sanctuary®, where war is brewing between the empire of Ranke and the Beysibs of Harka Bey over control of that infamous town of rogues and thieves, whores and priests, mages and mercenaries. Kama, his daughter, is on a covert mission and becomes apprenticed to Hakiem the storyteller, who claims to be neutral in this war but seems to have all the right connections. New to the Stepsons is Gayle, a foul-mouthed mercenary who can build a string of profanity around a single word; he’s been assigned to protect Kama, even from those who are trying to help her. But then Kama is framed – implicated in, and about to be indicted for sedition and attempted murder. One thing I’d like to mention is the women characters. In a review of one of the Sacred Bandbooks, the reviewer brought up the point that the female characters are either witches or goddesses. Now, part of that statement rings true to history, true to a time when women controlled most religions, when women ruled as queens. But women play much more diverse roles in the Sacred Band mythos than witches, goddesses, priestesses and even whores.First, there is Kama, a Sacred Band warrior as deadly, as proficient in the art of killing as any man. There are the two Lemnians, Breisis and Ditki, who once fought against the Band but have now joined with them. And then there’s Madame Bomba, a shrewd business woman who has her hands in everything, her eyes on everything, and her heart in the right place. 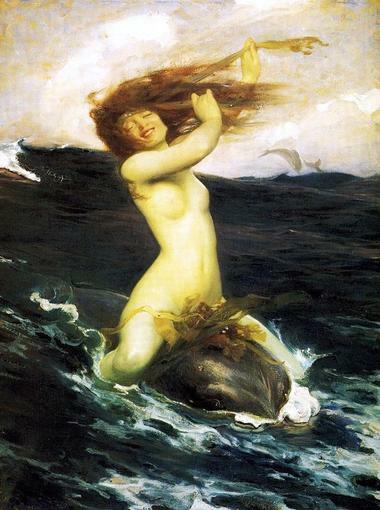 These women are all empowered – they are forces to be reckoned with, such as: a witch that even the gods fear; a necromant who feels love and compassion; a goddess who wants to be human; veteran warriors who have not sacrificed femininity and gentility, tenderness and caring. To talk more in depth about the plots of each story would be to give too much away. 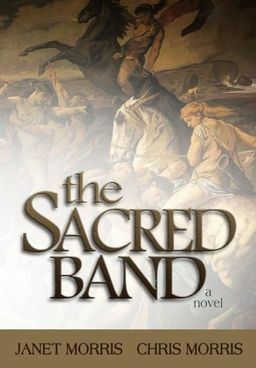 I think, I hopethat what I have given you here is tease enough and has piqued your interest enough to have you seek out this volume and lose yourself in the wondrously magical and yet all too gritty and real world of the Sacred Band. 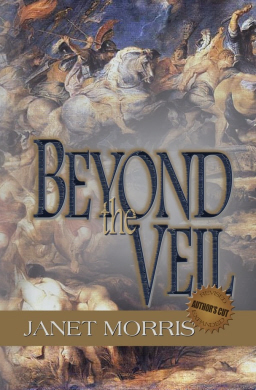 And for those of you who haven’t read my Black Gate and Amazon reviews of The Sacred Band, Beyond Sanctuary, Beyond the Veil and Beyond Wizardwall please check them out. I think you’ll like the realms of wonder created by Janet and Chris Morris. This week’s featured character from The Sacred Band tales is Straton. Straton is a character in the Sacred Band of Stepsons fictional universe who has been with the Stepsons since their formation. Straton is considered by many of the professionals in Tempus’s forces to be the deadliest warrior among them. Straton has fought in every engagement undertaken by the Stepsons with the exception of the period during which he served in Sanctuary as Tempus’s interim commander, and again when he fought at the Battle of Shaga while the Sacred Band Stepsons was between missions. Straton and Critias became a Sacred Band pair during the Wizard Wars and maintain a very close bond despite Straton’s infatuation with Ischade, the necromant. Perhaps feeling responsible for Straton being bolt-shot twice in the same shoulder, Ischade gave Straton his ghost horse, a mount who cannot die and cannot be harmed by mortal weapons. 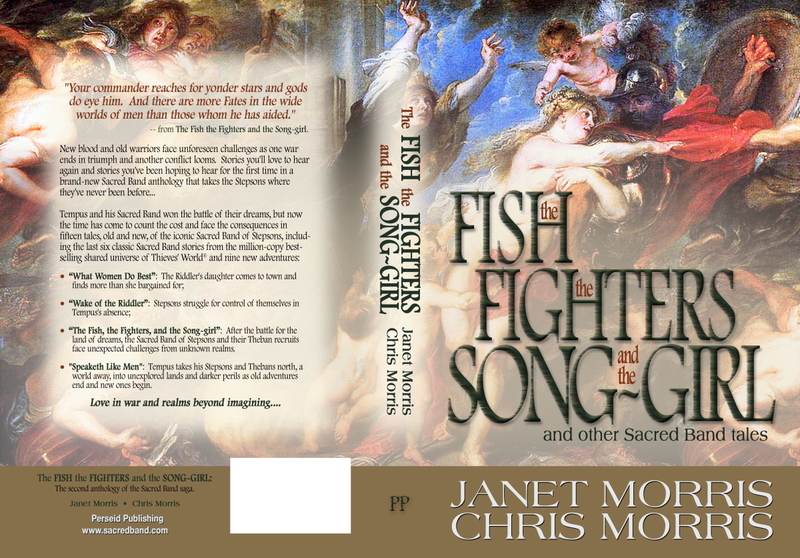 “The gods gave us horses so we wouldn’t have to fight on foot.” -Straton, from The Fish, the Fighters, and the Song- girl, by Janet Morris & Chris Morris. “It makes me irritable when people come around asking for trouble and I don’t have any ready for them. Now I’ll have to go find them and deliver some.” -Straton, from The Sacred Band, by Janet Morris & Chris Morris. “Something awful is always going to happen, Arton. It’s Sanctuary. You’re a Stepson. Awful is a big part of your job.” -Straton, from The Sacred Band, by Janet Morris & Chris Morris. “By Enlil’s third and fuzziest ball….” -Straton from The Sacred Band, by Janet Morris & Chris Morris. “I see all sorts of things when I’m clearing my pipes.” -Straton from The Sacred Band, by Janet Morris & Chris Morris. Check out more facts and details about Straton, and all the characters at the Sacred Band Freebase website HERE. Niko (Stealth, called Nikodemos) is a military character in the Thieves’ World shared fictional universe and the Sacred Band of Stepsons universe. Niko is a Bandaran-trained warrior-monk and an adept of the mystery of Maat, of balance and equilibrium, justice and truth. Niko is a Sacred Band fighter from humble beginnings, a ‘son of the armies.’ Niko begins his military career as an eromenos, then loses his ‘left-side leader’ and becomes an erastes, or left-side leader, in his next pairing with the Stepson Janni. After losing Janni to a witch, Niko is stalked by that same witch, Roxane, throughout the Wizard Wars. He leaves the Sacred Band during the Wizard Wars but returns to it. After that campaign, the storm god takes Niko to the City at the Edge of Time, where he formally becomes an adherent of Enlil, the Storm God, and marries the princess Tabet. Check out more information about Niko and all the characters in the Sacred Band at the Sacred Band of Stepsons Freebase Site here. 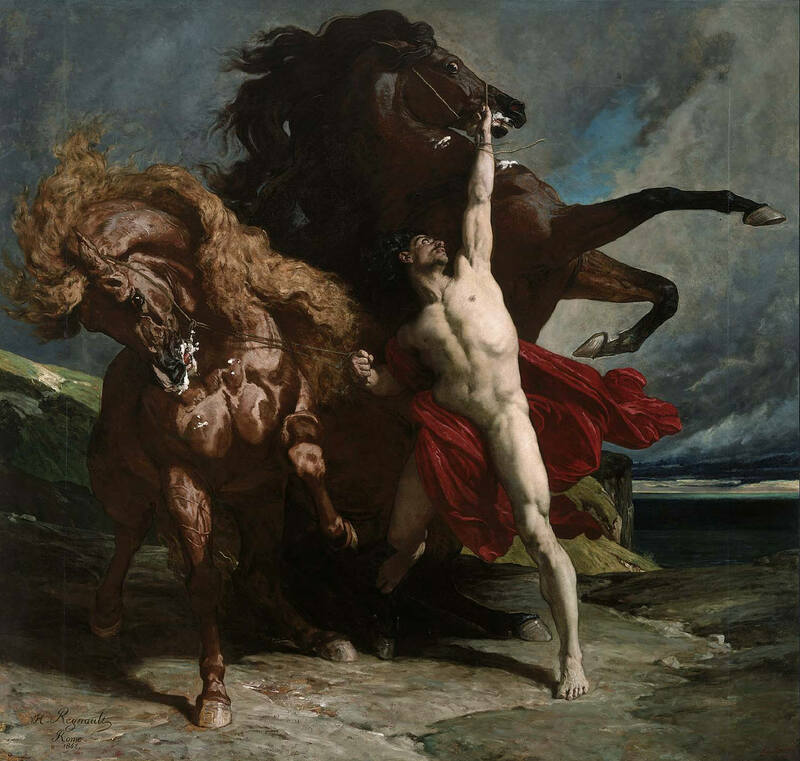 Painting: “Automedon and the horses of Achilles” copyright(c) Boston Museum of Fine Arts. Image used with permission of license to Janet Morris. Tempus is an immortalized military commander and a fictional character in the Sacred Band of Stepsons universe and the Thieves’ World shared fictional universe. 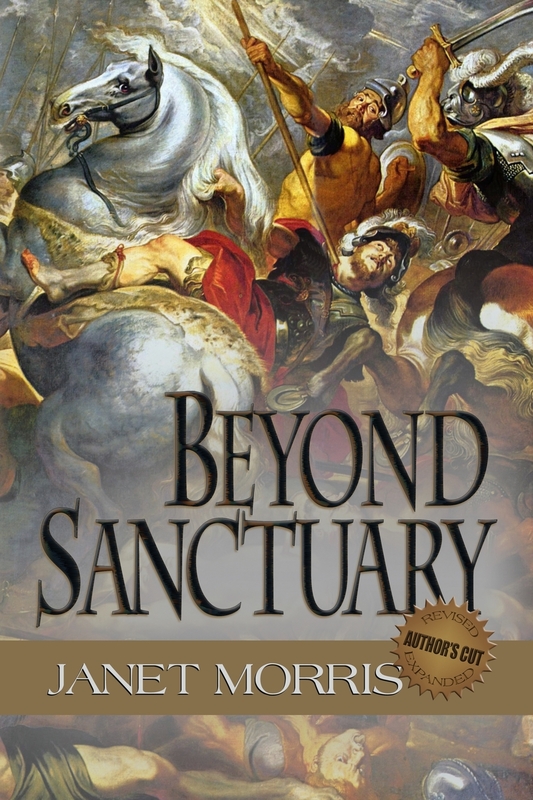 Tempus leads the Sacred Band of Stepsons, an elite band of ancient cavalry fighters through a series of adventures spanning seven novels and eleven stories written by Janet Morris and Chris Morris beginning in 1980. Tempus has many epithets, including The Riddler, the Black, Sleepless One, the Obscure. He is a favorite of the storm gods of the armies and serves them in a unique and intimate relationship. 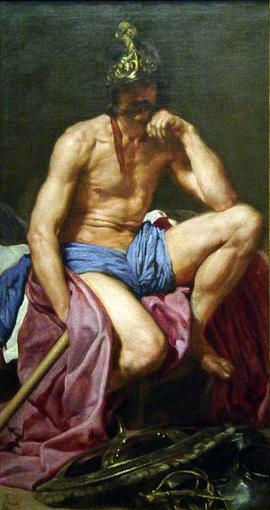 Tempus is a warrior philosopher, the alter ego of Heraclitus of Ephesus, who labors under an ancient curse that all who love him die of it and all he loves are bound to spurn him. this, plus his god-given ability to regenerate from any wound he takes, makes him a dark and demanding figure of heroic proportions. Through many of his adventures and military campaigns,Tempus leads the Sacred Band of Stepsons, with its core group of elite mercenary pairs which eventually includes forty-six hoplites rescued from the massacre of the Sacred Band of Thebes at Chaeronea in 338 BCE. A Man and His God now on The Book Rack! Read how the Sacred Band of Stepsons gets its name and meet Abarsis, Slaughter Priest. 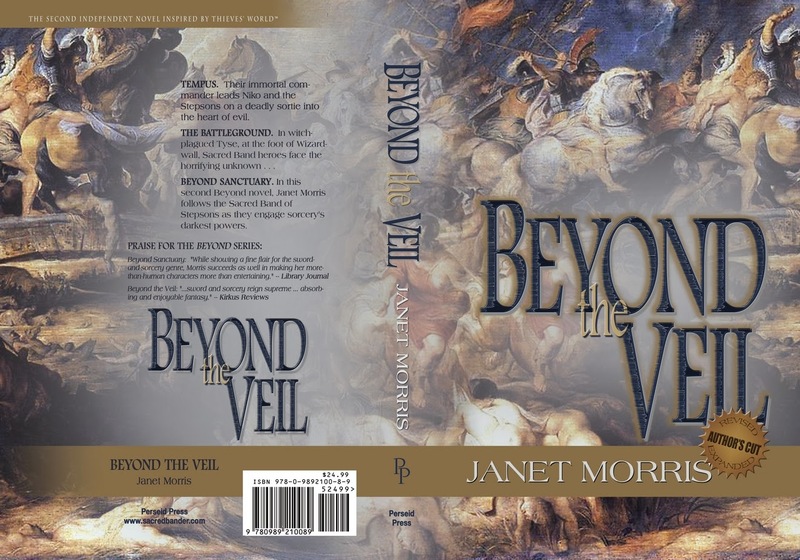 An iconic story from Thieves World(R), in an Author’s Cut edition totally revised and updated by Janet Morris.